For those who just can't get enough of Janis Joplin singing Me and Bobby McGee, Neko Case may be just thing for you. Case's voice is strong and soulful as she sings her songs of loneliness and heartbreak, pouring her emotions into her music with the raw edge of reckless abandon. 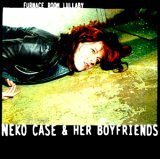 On her second album, the recently released Furnace Room Lullaby, Case is backed by an accomplished group of musicians that include ex-Freakwater member Bob Egan, Canadian country-rockers Dallas and Travis Good (The Sadies), and critically-acclaimed singer-songwriter Ron Sexsmith. The group is more than up to the task of matching Case's enthusiasm, lacing Mood to Burn Bridges with a bubbling beat and capturing the hometown roots-oriented style of The Band on Thrice All American. Furnace Room Lullaby is available from Barnes & Noble.